You’re a Phi Mu Forever and the bond you created with your sisters continues to remain strong. In six years, Forever Faithful has funded the relevant, powerful programs that continue to grow our vibrant fraternity and increase the value of your Phi Mu membership. This is your chance to offer even more women the opportunity to live their lives with love, honor and truth. 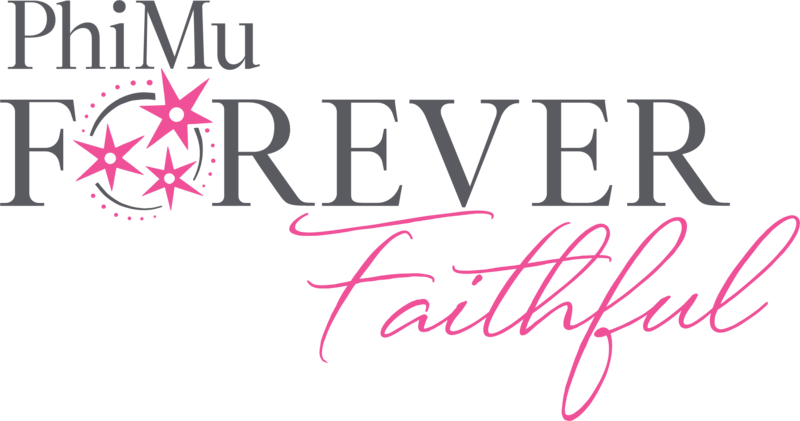 Log in with your MyPhiMu account and pay your Forever Faithful dues for 2018-2019 now! Don’t have an account? It’s quick and easy to create one with your name, initiating chapter and birthday. Welcome – and thank you for being Forever Faithful! Your contact information is shown below on the left side – feel free to update or make changes to this information so we can keep you updated on the Phi Mu Experience – and to receive your own copy of the Fraternity’s magazine, The Aglaia, by mail. Please note that the information you enter here will overwrite any older addresses, emails or contact information we currently have on file. To leave your legacy on the future of Phi Mu, enter your payment information on the left side below– and be sure to share with your networks why you’re proud to be a #PhiMuForever. Please provide your Phi Mu login credentials to continue. If you have forgotten your user name or password, click here. The user name or password provided was not valid. Your account could not be located with the information you provided. Your reminder has been sent! The password reset code you provided is incorrect. Your password reset is complete. You can now log in with your new password. Thank you for your commitment to Phi Mu Forever and for being Forever Faithful! Since we initiated the program six years ago, Phi Mu has grown exponentially – opening 22 new chapters and sharing the spirit of Mary, Mary and Martha with over 26,000 new collegiate women on 136 campuses across the country. This year, thanks to you – we’ll be offering the third annual Phi Mu Officer Academy to over 600 collegiate members, continuing over 2,000 mentorships through Mutual Connections, offering more training, networking opportunities and alumnae engagement experiences than ever before. As always, thank you for all you do to keep true to the meaning, spirit and reality of Phi Mu. You appear to already have an account created. If you have forgotten your credentials, please click here. It looks like the information you provided doesn’t match an existing record in our database. Please send us a message at alumnae@phimu.org or call 770.632.2090 for additional support. Once we find your record, we’re also happy to take your payment over the phone. Phi Mu Fraternity is a 501(c)7 non-profit organization. Because of IRS regulations, donations to the Fraternity are not tax deductible for income tax purposes.